Suffering from temporal construal? You and your reps probably are and you’re not aware of it. People uniformly say they’d rather have a half box today, but if they must wait a year, they can put off a week for the full box. The present is concrete; the future is abstract. When sales managers are setting goals with their reps, they are often glib about long-term goals. A long-term goal may have frequent progress updates, but the end measurement won’t happen for a long time — in a place our mind considers abstract. It’s easier for reps to commit to long-term goals that are unrealistic. “Sure, I can nail that annual goal,” reps often say at the beginning of the year. In the short term, reps are more realistic. Sales managers are likely to hear a rep say, “I won’t be able to close the Simpson deal this month because my contact is taking time off to care for an aging parent. Maybe next month.” This is concrete thinking and dealing with the concrete realities of the present. One solution is to set shorter-term goals. This allows reps to engage in more concrete thinking. They’re going to respond more realistically because it’s easier to practically plan for obstacles, challenges and opportunities to take advantage of. Goals can be expressed in many ways. Revenues and gross margin are just the beginning. Including goals for steps to the sale, such as cold calls, appointments, quotations, proposals and presentations are all valid reasons to set goals. With CRM tools such as Salesforce.com, all of these activities can be tracked and rewarded, if appropriate. One thing we know is that reps who set (their own) goals are more likely to achieve them. The best time to offer coaching is immediately after the experience. As a child, my family lived on a farm and it was expected that all six kids would learn to ride (and love riding) horses. As a child, I was thrown or fell off many times. My father’s comment was always the same: Get back on the horse. Now. There was good rationale for it. If I waited, the experience would be less concrete and less specific. Overcoming my irritation or fear (or both) would not dissipate the way it would if I simply put my foot in the stirrup and got back on the 800-pound animal. This is temporal construal working its magic. Offering coaching tips to your rep two months down the road is a waste of time and energy. After two months, critical comments are abstract ideas in the mind of the rep. Coaching is more purposeful when it is immediate. One caveat: If you’re unprepared, unresolved about the solution or can’t be calm and objective about the message you want to deliver, don’t present it. Being timely will increase your effectiveness only if you’re on your game. are real and can have real implications on your business. The practical implications of temporal construal can impact the lives of your reps and the success of your business. How we think about near-term events in concrete ways and far-off events in more abstract ways should impact the ways you manage your teams. Tim Houlihan is an evangelist of applied behavioral economics with more than 25 years of experience in product development, training, sales leadership and marketing strategy. His consultancy is based on authentic, empathetic and insightful business partnership to help clients ask the next question. Tim can be reached at tim@timhoulihan.com. Online bonus: Temporal distance influences workers’ response to being recognized for stellar performance. Learn why more immediate recognition is vital at SalesandMarketing.com/lift. 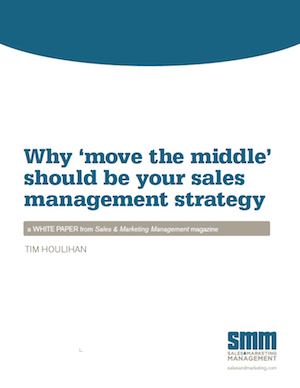 There are no best-sellers written about middle performers who stayed in their lane. But there are libraries written about the well-loved top performers. "When sales reps are offered cash incentives they perform at a lower level. When offered non-cash prizes, they perform at a higher level. In nearly every case when measuring a motivator..."
"How do we develop incentive systems that motivate and reward employees to maximize results? 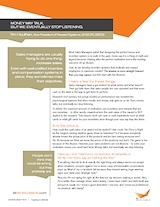 Download this white paper to learn why."